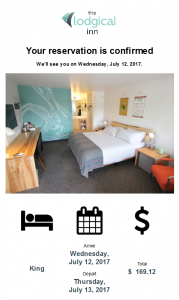 Sending emails to your guests not only provides the guest information about their stay, but also keeps you and your clients connected. With Lodgical Solution HTML emails, you can enhance your customers’ overall experience with your property. For example, pre-arrival emails are the first interaction between you and your guests after they have booked. Sending your guests welcoming and helpful emails could really make a difference for first-time bookers. HTML emails are emails that are formatted like a webpage, using colors, pictures, and links, while plain text emails only include text. A main advantage of using HTML emails is their readability for your customers. Contact information and essential details can now be found at ease. Clickable links make it easier to engage with your message. Readers process visuals faster than text, which will increase readability and satisfaction. Images will also reinforce your brand and attract attention. Lodgical Solution offers two types HTML emails, Basic and Upgraded. 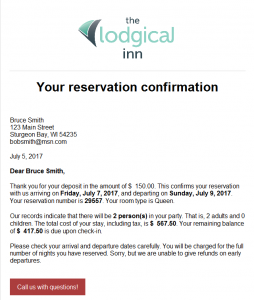 Both include six customized email templates including: confirmation, cancellation, modification, pre-stay, post-stay, and receipt. They also include clickable links to your property’s social media pages, directions, and weather. Each version does a great job at providing your customer a welcoming feeling. One major difference between the two emails is that the Upgraded version allows you to include another image besides your logo. This could be a great way to show off an attraction at your property or your area. The upgraded version also highlights reservation information. If you are interested in getting Lodgical Solution HTML emails set up for your property, or if you have any questions, give the office a call at 920.746.0606.